I am so sorry Margaret. Terribly sad. My thoughts are with you. Bless you, Cecilia. I so appreciate your thoughts. He was an amazing little boy who lived with me for 3 years. He was always smiling. 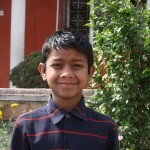 That’s my memory of little Idi, a smiling little bundle of joy! I miss him terribly.